This review of the Sabre Pepper Spray covers the most popular compact red pepper spray units being sold online and in some retail outlets. As a protective device that can be conveniently carried around, you will get a sense of security you did not otherwise have when you carry a quality pepper spray self defense product. The Sabre compact pepper spray will provide you with a reliable defense against would-be attackers. It also comes in pink which actually is a pretty accessory that can be attached to purses and bags too. The compact Sabre pepper spray shown here has approximately 25 shots, projects up to 10 feet, and has a 4 year expiration date so it can provide for your protection for a long time. Moreover, it can be easily accessed and used, so that you can immediately protect yourself when you are in dangerous places or unfamiliar neighborhoods. With key chain - You can easily bring along this pepper spray with you, as it can be attached to your car keys. Powerful stream - The Sabre pepper spray can be used up to a maximum of 10 feet, and the force of spray minimizes wind blow-back so that the mist won't affect the user. Quick-release functionality - You can immediately access the pepper spray's quick-release ring if the situation calls for it. Multiple shots - This device can give off approximately 25 shots. Easy to carry - These Sabre pepper spray units are light and compact. Reasonable price - You can get the Sabre Red Compact Pepper Spray with pink key case for only about $7; whereas other similar products can cost up to $15 per canister. 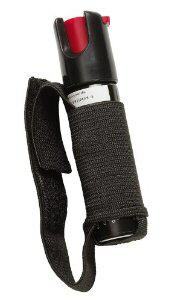 Powerful - For a compact pepper spray unit, it is powerful - it can spray up to 10 feet. Unlocks easily - According to some consumers, the safety lock on this device is not that efficient. When placed inside the purse, the unit can get unlocked and can be accidentally pressed on. 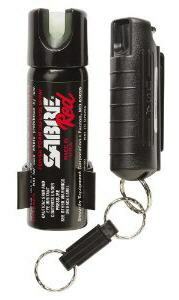 The Sabre Red Compact Pepper Spray is generally liked by customers who have already purchased and used the product. Some users have even tested it, and found it to be effective for self defense. However, there were some negative feedbacks and reviews from unsatisfied customers too. According to some consumers, the safety lock on this unit is almost useless as it can easily get unlocked anyway. It is therefore more practical to place it inside its case for safety purposes. There were also those who would have preferred a belt-clip design on the device. This way, it can be conveniently carried even when jogging or walking the dog. Another minor issue taken up by some customers is the bright pink color. It is as if the pepper spray is shouting out "look at me!" However, the pink color comes with a purpose, as it is supposed to raise awareness for breast cancer. We highly recommend the compact Sabre Pepper Spray as it is used by police departments worldwide. It just goes to show how effective and useful this device is, and it is also lawful for civilians to have this unit with them. But if you can afford a few dollars more the Sabre Home and Away Pepper Spray Kit is a good deal. Lastly, if you like to go jogging the Sabre Red Jogger Pepper Spray is was built to take with you on your runs. This unit fits in the palm for a nice fit while you run, jog, or walk and has a strap that enables you to unleash it quickly in the event you need to deploy it during an attack. The Sabre pepper spray products listed above are all very affordable pepper spray accessories and self defense devices, and it can give you peace of mind when you have the device in your pocket or purse. With its powerful burst of spray that can reach up to 10 feet, the Sabre Red Compact Pepper Spray can hinder any attacker from harming you.